This book was originally a Japanese edition 天野シロ ART WORKS KINGDOM HEARTS that was published in 2007 and has since gone out of print. This English edition is published by Yen Press. It's a 112-page paperback that comes with a thin plastic slipcase. On the front you have a shape of Mickey's head that's transparent so you can look through to the cover. On the back is a transparent keyhole. 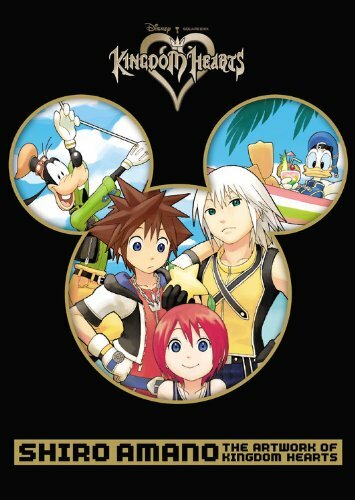 The book collects Shiro Amano's artworks from the Kingdom Hearts manga series, namely Kingdom Hearts, Kingdom Hearts: Chain of Memories and Kingdom Hearts II. If you follow the manga series, you'll have a convenient collection of art from the covers and other illustrations collected here. Fans of the manga would already know what to expect from Shiro Amano, and should probably also like this book. To me, the quality of art is a mixed bag. There are two main styles here which I will loosely classify as painted without outlines, and the more anime and manga style with outlines. The ones with the outlines are generally quite good, the ones without can look kind of rough. There's one issue with the printing of text on several pages. As they are stretched across two pages, text in the middle got into the gutter which makes it difficult to read. For this book, I would definitely suggest checking out the interior pages before buying.